Shayna Zerbe, right, instructs Garret Sloan on how to fire a fully automatic machine gun in 2014 at Machine Guns Vegas. Nevada's gun laws are lax compared to other states, and gun tourism is nearly as ubiquitous in Las Vegas as gambling and stage shows. Next door to the Mandalay Bay casino where Sunday night's shooting rampage occurred on the Las Vegas strip, British tourist Gary Shepherd was struggling like nearly everyone else to process what happened. "Whether this will finally change your gun laws, I fancy not, personally," Shepherd says. The country's latest – and now deadliest in recent history – mass shooting has again reignited debate over gun control, and whether tougher gun laws could prevent future tragedies. The early analysis is that Shepherd's hunch is probably right. Just like in many other western states with large rural populations, Nevada's gun laws are relatively lax, and have proven hard to change. Hunting, recreational shooting and gun ownership is woven tightly into a lot of people's identities here. And even in more liberal-leaning Las Vegas, gun tourism is nearly as ubiquitous as gambling and stage shows. "We have a very strong gun culture, especially in rural Nevada and in Mesquite which is where the shooter is from," says Natalie Hernandez, a gun violence prevention organizer with the group Battle Born Progress. Liberal groups like Hernandez's that support stronger gun control won a victory last fall when a ballot measure calling for background checks narrowly passed. But any celebration was short lived. Nevada's Attorney General Adam Laxalt, a Republican, ruled the new law is not enforceable because the federal government signaled it would no longer help states that have passed more restrictive background checks. For her part, Hernandez thinks that after this massacre, the conversation on gun control should start to shift even in Nevada. "I don't think a lot of people are informed and educated on the fact of how easy it is to buy a gun here and the fact that you can legally carry it anywhere," she says. Nevada is an open-carry state, meaning openly carrying long guns, rifles and other weapons in public places is generally okay, apart from in courtrooms and in schools. Some casinos have also moved to prohibit them. It's also relatively easy to obtain a concealed-carry permit and there are no restrictions on semi-automatic weapons or large-capacity magazines. For several decades, Clark County, which includes Las Vegas, did have a handgun registration law. But that ended two years ago when the conservative state legislature prohibited cities and counties from passing local gun ordinances. "I've seen some stuff in the last couple of days saying we have some of the laxest gun laws and that's not quite technically true," says Ian Bartrum, a constitutional law professor at the University of Nevada Las Vegas. Voters in the Las Vegas area were largely credited with tipping last year's background check law into the yes column. Bartrum says it's of the only places in the state where you'll find some broad support for gun certain control measures, largely because it's a major metropolitan area with a dense population. But even here, with shooting ranges and other gun tourism as big of a part of the economy as it is, gun politics are still complicated. "It's very difficult in the West and in Nevada in particular to talk about gun control and have it go very far," says Bartrum. The issue of whether tougher gun laws could prevent mass shootings is especially complicated, because you're dealing with state laws, federal laws and a Constitutional right to gun ownership, with some jurisdictions passing laws in conflict with the other. Federal law is still pretty restrictive when it comes to who can own fully automatic weapons manufactured after 1986, the last time Congress revised the National Firearms Act. And gun law experts point out that you have to be licensed to buy parts that convert semi-automatic weapons to automatic. As law enforcement's investigation continues, people like Gary Shepherd, the British tourist, are left to wonder whether new restrictions would even make a difference. "If you'd have said right, we're gonna have new gun laws now, there are [still] so many weapons out there," Shepherd says. Indeed, the sharp divide in this country over gun ownership and gun policy in the wake of deadly mass shootings will, by all accounts, continue. This is especially true for Nevada, where lawsuits are already being threatened against the state over its refusal so far to enforce the background checks ballot measure...the same one the voters already approved. Whenever there's a mass shooting a debate about gun control follows, and the massacre in Las Vegas is no exception. Nevada has some of the most lenient gun laws in the country. NPR's Kirk Siegler reports. KIRK SIEGLER, BYLINE: On the Vegas Strip just next door to the Mandalay Bay Casino where the shooting occurred, British tourist Gary Shepherd is struggling like nearly everyone else to process what happened. GARY SHEPHERD: Whether this will finally change your gun laws - I fancy not, personally. SIEGLER: The early analysis is that Shepherd's hunch is probably right. Just like in many Western states with large rural populations, Nevada's gun laws are relatively lax and have proven hard to change. Hunting, owning guns and shooting is woven tightly into a lot of people's identities. And even in more liberal-leaning Las Vegas, gun tourism is nearly as ubiquitous as gambling and stage shows. NATALIE HERNANDEZ: We have a very strong gun culture here in Nevada, especially in rural Nevada and in Mesquite, which is where the shooter was from. SIEGLER: Natalie Hernandez is the gun violence prevention organizer with the group Battle Born Progress. Groups like hers that support stronger gun control won a victory last fall when a ballot measure calling for background checks narrowly passed, largely thanks to support of voters in Las Vegas. But any celebration was short-lived. Nevada's Republican attorney general ruled the new law is not enforceable because the federal government signaled it would now not help states that have passed more restrictive background checks. But Natalie Hernandez thinks that after this massacre the conversation on gun control will start to shift even in Nevada. HERNANDEZ: I don't think a lot of people are informed or educated on the fact of how easy it is to buy a gun here and the fact that you can literally carry it almost anywhere. SIEGLER: It's legal in Nevada to openly carry long guns, rifles and other guns in public places, including bars and restaurants, pretty much anywhere but in schools or courtrooms. Now, some casinos have moved to prohibit them. Nevada also does not ban semiautomatic weapons or large-capacity magazines as some states do. Police say the gunman in Sunday night's massacre stockpiled 23 guns in his hotel room at the casino. 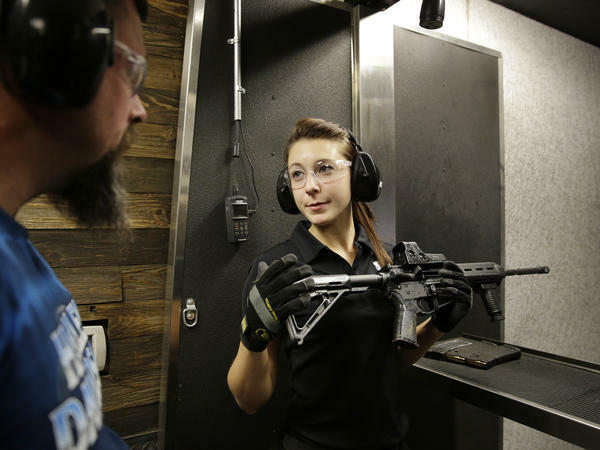 For several decades, Las Vegas and Clark County did have a handgun registration law, but that ended two years ago when the conservative state Legislature prohibited cities and counties in Nevada from passing local gun ordinances. Ian Bartrum is a constitutional law professor at UNLV. IAN BARTRUM: You know, it - frankly it's kind of interesting that, you know, we think of the Wild Wild West, but the Wild Wild West was actually far more restrictive on gun carrying than the modern West is in many places. SIEGLER: For legal experts, the issue of whether tougher gun laws could prevent mass shootings is especially complicated because you're dealing with state laws, federal laws and a constitutional right to gun ownership. Federal law is still pretty restrictive when it comes to who can own fully automatic weapons, and gun law experts say you have to be licensed to buy parts that convert semiautomatic weapons to automatic ones like the so-called bump stocks that were reportedly used by Stephen Paddock Sunday night. As law enforcement's investigation continues people like Gary Shepherd, the British tourist, are left to wonder whether new restrictions would even make a difference. SHEPHERD: If you'd have said, right, we're going to have new gun laws now, there are so many weapons out there. How long before they're out of circulation? It'll still go on for decades. SIEGLER: And so the sharp divide in this country over gun ownership and gun policy in the wake of deadly mass shootings will by all accounts continue, especially in Nevada, where lawsuits are already being threatened against the state over its refusal so far to enforce background checks that the voters already approved. Kirk Siegler, NPR News. [POST-BROADCAST CORRECTION: In the audio version of this report, as well as an earlier Web version, bump stocks are incorrectly cited as an example of gun parts that require a license to purchase. That was incorrect. Bump stocks may be purchased without licenses. ] Transcript provided by NPR, Copyright NPR.